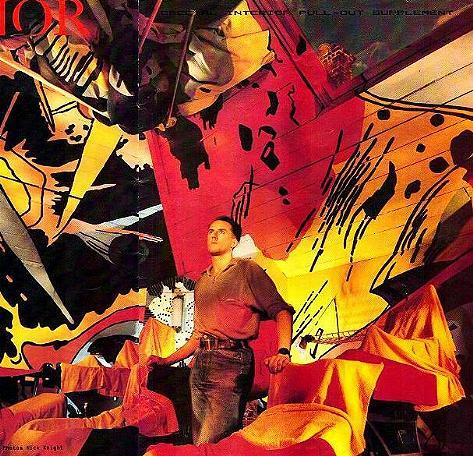 Mick Hurd used to be assistant designer in the theatre ( Yakety Yak) and has done Art Direction on BFI films. These days he¥s doing mostly shop windows, and is seen here standing in Antenna, which windows he has redone. 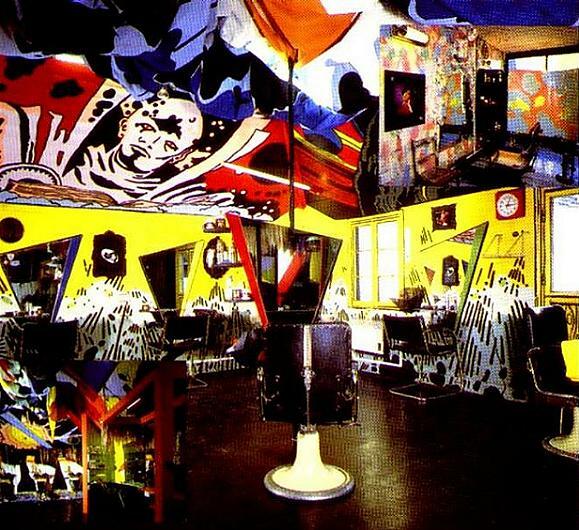 ‘The design had to incorporate the existing furniture and mirrors, it was white before, so I went the opposite way – Universal Chaos….They’re randon cartoon images, blown up to enormous scale, so you can’t really see where they come from – You spend so many hours getting a bob-tail in there, it’s good to have something to look at. It was cheap and quick, with a couple of years life expectancy – it already has feet marks up the walls… Mick would ideally like to live in a big London house with a garden and 3 Ford Consuls in the triple garage, and is looking to do Art Direction on films, via promos.